Meta: Paddle through an incredibly biodiverse floodplain. Stands of huge, bottom growth hardwoods tower over nutrient rich waters filled an amazing array of flour and fauna. Not officially a swamp, since the area is not submerged all the time, the nutrient rich waters the feed Congaree National Park might as well be. Huge cyprus trees block much of the mid-day sun while the dark waters flow a hundred feet below their crests. The “swamp” affords plenty of protection to its many inhabitants. Frogs, salamanders, fish, and dozens of bird species jump and call from the water, bank, and tree limbs. Paddling through the dense forest brings on a surreal sense of tranquility unlike anything found in Charlotte. Congaree is the first, and only, national park in the state of South Carolina. Created to protect this unusual habitat that so many call home, it’s a rare opportunity to paddle through a swamp-like ecosystem just a couple hours from Charlotte. Two local rivers feed the wetland and, along with several other creeks form oxbow lakes. These nearly still bodies of water, created by bends in the river, are absolutely teeming with life. A marked canoe/kayak trail follows Cedar Creek with three put-in spots. If you don’t want to sort out a car drop you can easily see many of the best parts of the park by putting your boat in at the Cedar Creek Landing. From there it’s easy enough to paddle up and down stream as far as your time allows. While the dark and, at times, mysterious water get the most the attention, it’s the forest that’s the real award winner. The park contains the largest intact expanse of bottomland hardwood forest communities in North America. Average tree height is over 100 feet and the champion Loblolly Pine in Congaree is 167 feet tall with a circumference of 15 feet. There are two ways to explore the park, by foot or by boat. Twenty Five miles of mostly flat hiking trails, including 2.4 miles of boardwalk, work their way throughout the park. Ranger guided interpretive walks are scheduled every week or you can venture out on your own. Congaree isn’t for the adrenaline junkie. At least not in the traditional sense. Exploring the trails, both on land in water, is about submersing yourself in a totally foreign ecosystem to what’s found around Charlotte. The paddle is typically easy enough for inexperienced paddlers and families and the walking trails are easy enough for all ages. 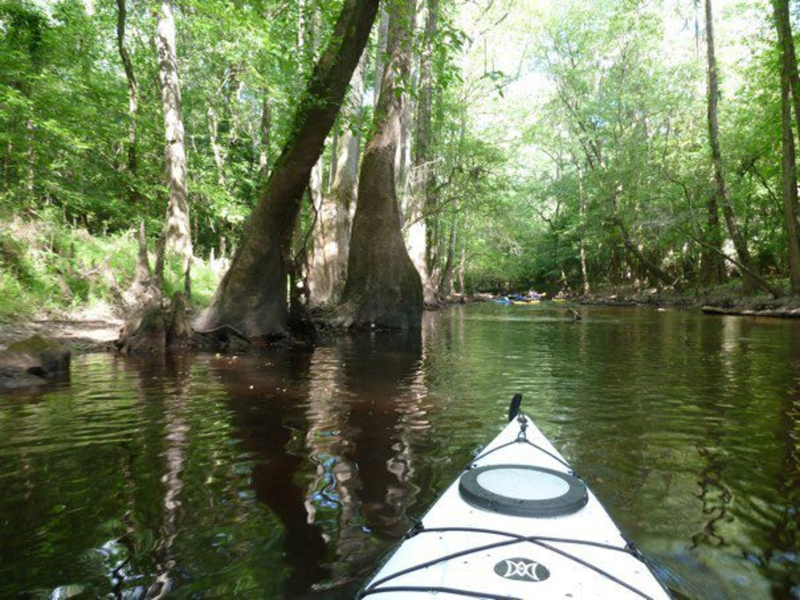 Congaree is both an excellent family adventure and a great experience for flat water paddlers of all ages. The park is open 24 hours a day, 7 days a week but the visitor center is open Tue through Sat 9am to 5 pm. Restrooms and trail guides are available 24/7 at the visitor center breezeway. The paddle might require getting out the boat to shimmy over downed logs. While the waters are typically calm, it’s always a good idea to check with a park ranger before embarking. The visitor center has plenty of info for your trip as well as water and bathroom facilities.